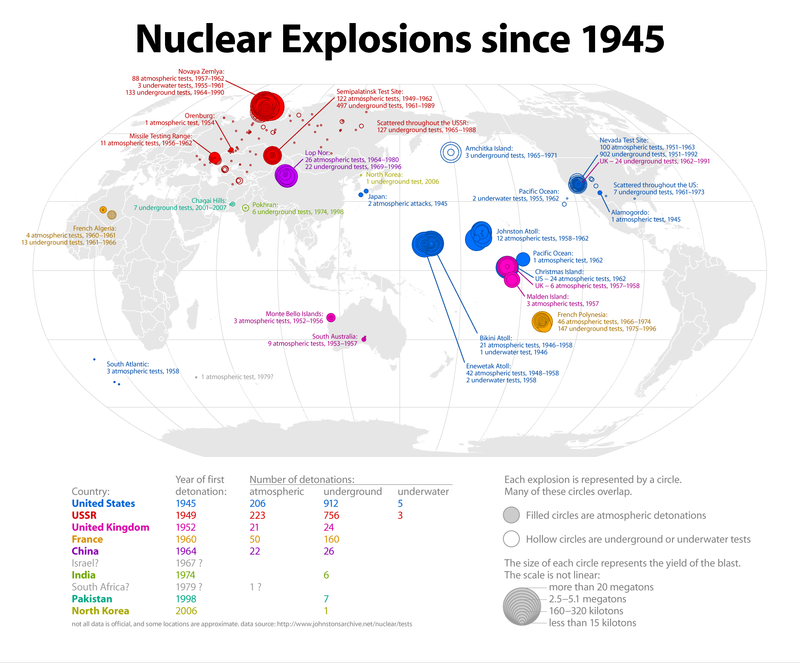 Found this really interesting picture via disinfo today showing where nuclear bombs have been exploded all over the world since 1945. According to this (and taken with the usual internet-sized pinch of salt), at least 2,423 bombs have been exploded in the last 60 years. Interesting picture indeed. Can't help but notice that the only 2 occasions where atmospheric attacks are listed are the US strikes on Japan in 1945. Dicks. See, this is what the internet is all about. You post this - I check it out - then head to wiki and chain-wiki from explosion to disaster to meltdown - to radiation sickness and everything in-between. Consequentially I have had nightmares for the last two nights.